With the number of Canadians of core working-age at its lowest proportion on record and projected to keep falling, a new survey conducted by The Harris Poll and commissioned by Express Employment Professionals, found that employed baby boomers want to keep working in retirement, but most say their company doesn’t offer the option. The newly-released poll found that the majority of working baby boomers are satisfied with their current job and would stay in the workforce if semi-retirement was an option. However, many also said their current employer does not offer the option to semi-retire and has not brought back retirees in the past. At a time when businesses and government are struggling to deal with anticipated labour shortages caused by retiring baby boomers leaving the workforce, the poll points to a large disconnect that needs to be urgently addressed. The poll reveals other warning signs for employers, with half of baby boomers saying they do not think an adequate successor is in place for when they retire. The poll also found that almost 40% of working baby boomers will retire later than anticipated, primarily because they haven’t saved enough money for retirement, or because they choose to keep working. The national survey of 500 workers aged 54 to 72 was conducted online by The Harris Poll between Oct. 16 and Nov. 6, 2018, on behalf of Express. It offers a detailed, in-depth look at the background and attitudes of Canadian workers between the ages of 54-72. According to the poll, many working baby boomers say they would take an option to semi-retire if available, but the majority say companies don’t offer that option. But only 30% of boomers say their employer offers the option of semi-retirement. In addition, only 36% of boomers say their employer has ever brought back a former employee who retired. 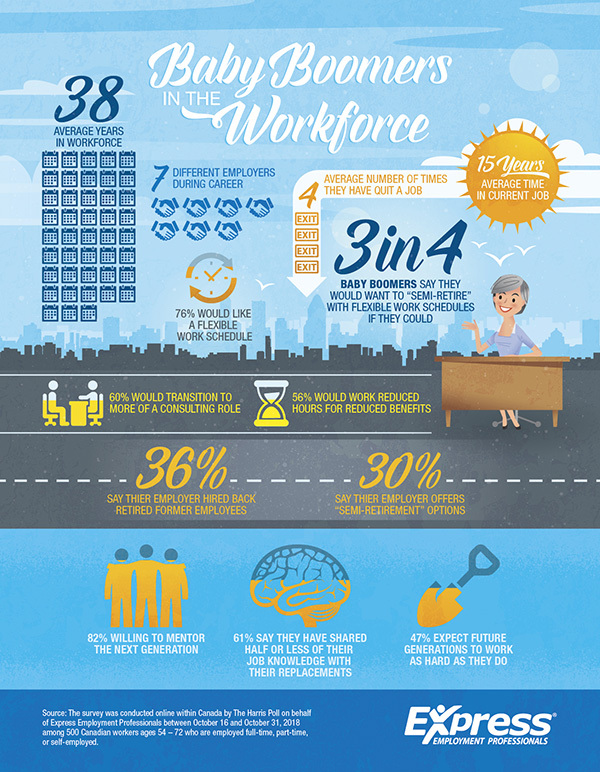 With working boomers beginning to leave the workforce, they have several concerns about the transition process. Half (51%) of working baby boomers do not think their employer has an adequate successor to replace them. While 82% of boomers say they are willing to mentor the next generation of workers, a majority of boomers say they have not shared most of their knowledge with those who will replace them once they retire. Only 40% of boomers say they have shared more than half of their required knowledge. 22% say they have shared half of their required knowledge. 19% say they have shared less than half of their required knowledge. 20% say they have shared none of their required knowledge. Just over half (53%) of working boomers do not think subsequent generations will work as hard as they have, but boomers have confidence that future generations will be prepared to take their place when they retire (except for Generation Z). 84% believe Generation X (ages 39-53) will be well prepared to replace them. 60%t believe millennials (ages 24-38) will be well prepared to replace them. Only 36% believe Generation Z (ages 18-23) will be well prepared to replace them. While 50% of employed baby boomers who cite a planned retirement age say they will retire when anticipated (average age of 64), 39% plan to retire later than originally anticipated. 50% plan to retire at age anticipated. 39% will retire later than planned. 11% plan to retire earlier. Of the 39% who plan to retire later than anticipated, the main reasons given were lack of savings, followed closely by a desire to keep working. 50% haven’t saved enough money. 24% due to unexpected expenses (e.g. medical expenses, divorce). Employed boomers say they are generally prepared for retirement. 79% say they are physically prepared to retire. 72% say they are emotionally prepared to retire. 60% say they are financially prepared to retire. 32% need help to figure out what steps they need to take in order to retire. 32%need help transitioning to part-time. 28% need help to determine what medical coverage they will have. Baby boomers in Canada have worked, on average, for 38 years and for an average of 7 different employers. Fifty-nine per cent have been working for their current employer for at least 10 years (on average 15 years). A striking 80% of baby boomers say they have never been fired from a job. Most have quit their job (77%), on an average of four times. Another 48% say they have been laid off at some point, and 20% say they have been fired at least once. The vast majority of employed baby boomers work full-time. The survey was conducted online within Canada by The Harris Poll on behalf of Express Employment Professionals between Oct. 16 and Oct. 31, 2018, among 500 Canadian workers ages 54 – 72 who are employed full-time, part-time, or self-employed. Results were weighted as needed for age by gender, education, race/ethnicity, region, and household income. Propensity score weighting was also used to adjust for respondents’ propensity to be online. Totals may not equal the sum of their individual components due to rounding. No estimates of theoretical sampling error can be calculated; a full methodology is available upon request.